This property rents for a minimum of 1 week. 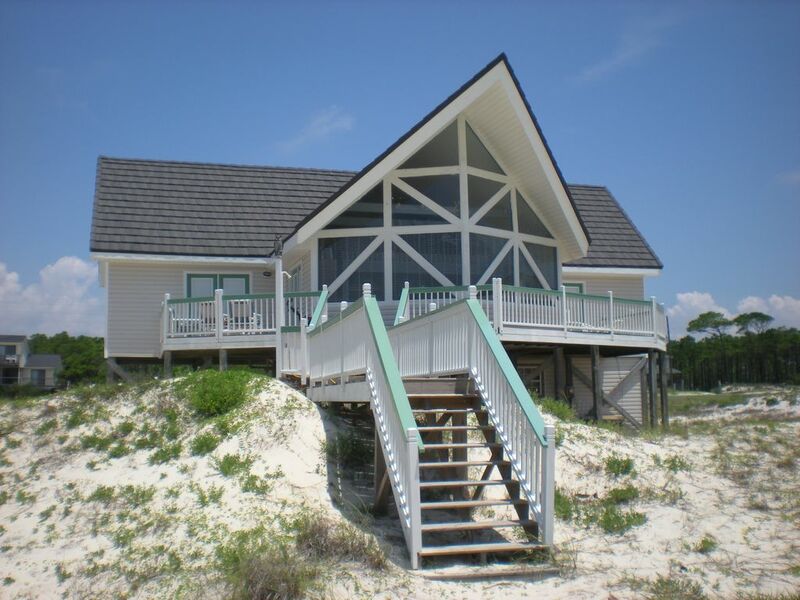 Located beachside in desirable East End of St. George Island, this home has a beautiful view of Gulf. The beach is less than 500 feet away and no roads to cross to get to the beach. Featuring four bedrooms and two baths, this home has a large family room and kitchen as well as a loft with sofa sleeper for overflow sleeping. Your entire party can enjoy eating together at the expansive dining table which comfortably seats twelve with adjoining breakfast bar for additional seating. For your outdoor enjoyment, two large decks provide ample space to experience breathtaking sunsets. Small, well trained pets are allowed. Large living area including living room with plentiful seating for everyone. Extra large dining area with 10 foot table capable of handling the whole family. Great for eating together, games and puzzles. Large screen TV's in living room and master bedroom. Smaller TV's in remaining bedrooms and lofts. All on cable service. Plentiful outdoor decking on both the front and back of the house as well as dining tables and chairs an lounge chairs. Well equipped kitchen with dishwasher, microwave, frig with icemaker. Washer/dryer, telephone including free long distance, free wireless, coffee maker, high definition cable TV with TV/DVD's in bedrooms, loft, and family room, stereo (bring your own media), jigsaw puzzles, lots of books, an outdoor shower, charcoal grill, fish prep table with sink and water, and covered parking. And, of course, central heat (probably won't need that in July!) and air. Two bedrooms have King Beds, one bedroom has a King and a Single, one has a futon bunkbed (double on the lower and single above). Loft has a sleeper sofa. Linens are provided. No Smoking please. Super beach house. It's an easy, safe walk to the beach and the decks are comfortable with nice views. The kitchen is really, really well equipped for a beach house. Spacious common area and comfy beds. The only caveat is that to get to the second story, there's a tight spiral staircase, which can make carrying luggage up & down tough, and can be tricky for kids - we had two big falls from kids coming down from the bedrooms (and one from an adult...). If your family is at the right age & agility level for the staircase, though, this is a fantastic place. We really enjoyed our stay at the SS Wedidit! There were 9 of us and a dog. The dog really enjoyed the gated porch & we really enjoyed the proximity to the beach. We saw dolphins the first day & shooting stars the last day. St. George Island is a great place to adventure, with plenty of water sports & restaurants to visit. Close proximity to beautiful beach. Good place to comfortably sleep 6 adults and 2 kids. This is a great house for a family vacation including our adult sons and their families. We take turns using the spacious kitchen to cook the delicious local seafood and dine on the front deck watching the sunset. There are lovely views of the ocean from the downstairs den and especially upstairs in the cozy seating area outside the upstairs bedrooms. Everything about the house makes us feel that we are relaxing on vacation at our favorite spot, St. George Island! My family of five and our dog recently stayed at Wedidit. The Island: St.George Island is a hidden treasure for beach goers who want that beach experience from days gone by. There are no crowds here. There is plenty of elbow room on the beach. Our dog can swim and chase the ball. We can leave our beach gear on the beach during the day and not worry about it. The beach and waters are pristine with turtles and porpoise all around. The House: This house in not beach front but you don't have to cross a road to get to the beach. Just a sandy driveway. So you are getting across the street pricing for an "almost beach front" place. The house was more space than our family of five needed. The bedrooms were spacious with comfortable beds. The bathrooms are on the smaller side. The large family room and dining area and the upstairs common space provided plenty of space for our kids to spread out on a rainy day. The vaulted ceiling with the floor to ceiling windows provided lots of great light and nice views of the gulf. The kitchen was well stocked with plenty of plates, silverware glasses and pots/pans. The amenities are somewhat dated but perfectly serviceable for a beach house. One nice surprise was the Kitchen Aid charcoal grill under the house. It is the nicest charcoal grill I have seen in a rental house and made grilling all our seafood a pleasure. There is an outdoor shower but it is cold water only and not enclosed. It is more of a rinse off shower. I recommend this house to those looking for a great value in a beach house. We had 10 people in our family stay at SS Wedidit. The house was so clean and had plenty of room for everyone. The view from the spacious living room was beautiful. The deck was great. The walk to the beach was quick and easy. There was a full size grill and we loved the breeze under the house. The kitchen was the best stocked kitchen I have ever had in a rental. The fishermen in our family caught something everyday! We had a great time! Thank you so much to the owners for sharing this beautiful home with us. The 'East End' extends for two miles between Gulf Beaches and the Julian G. Bruce State Park. The beach is amazing, often under-populated, sometimes downright secluded. Consider surf fishing on the beach, rent bikes, or go walking for seashells. Enjoy the sun, the surf, and watching the dolphins. Enjoy sitting on the deck, relaxing and doing absolutely nothing. If you are into something a bit more challenging you might consider kayaking, sailing, snorkeling/diving, windsurfing, boating or jet skiing. For the golfer, St. James Bay golf club, located a short drive away in Carrabelle, Florida, provides a enjoyable yet challenging experience for every golf enthusiast. If you don't catch enough fish on your own, try the seafood dining on the Island, in Apalachicola or elsewhere along the Gulf Coast.